Competing ideas suggest how sloshing motions could maintain a primordial magnetic field. Geophysicists call it the new core paradox: They can't quite explain how the ancient Earth could have sustained a magnetic field billions of years ago, as it was cooling from its fiery birth. Now, two scientists have proposed two different ways to solve the paradox. Each relies on minerals crystallizing out of the molten Earth, a process that would have generated a magnetic field by churning the young planet's core. The difference between the two explanations comes in which particular mineral does the crystallizing. Silicon dioxide is the choice of Kei Hirose, a geophysicist at the Tokyo Institute of Technology who runs high-pressure experiments to simulate conditions deep within the Earth. “I'm very confident in this,” he reported on 17 December at a meeting of the American Geophysical Union in San Francisco, California. But David Stevenson, a geophysicist at the California Institute of Technology in Pasadena, says that magnesium oxide — not silicon dioxide — is the key to solving the problem. In unpublished work, Stevenson proposes that magnesium oxide, settling out of the molten early Earth, could have set up the buoyancy differences that would drive an ancient geodynamo. 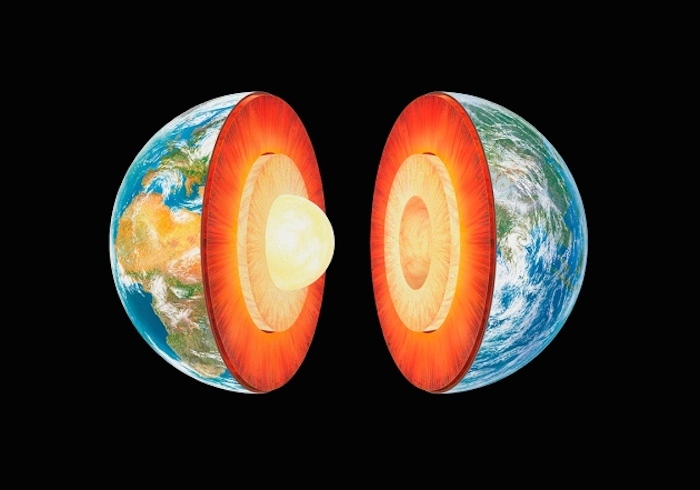 The core paradox arose in 2012, when several research teams reported that Earth's core loses heat at a faster rate than once thought1, 2. More heat conducting away from the core means less heat available to churn the core’s liquid. That's important because some studies suggest Earth could have had a magnetic field more than 4 billion years ago — just half a billion years after it coalesced from fiery debris swirling around the newborn Sun. “We need a dynamo more or less continuously,” Peter Driscoll, a geophysicist at the Carnegie Institution for Science in Washington DC, said at the meeting. In his Tokyo laboratory, Hirose put different combinations of iron, silicon and oxygen into a diamond anvil cell and squeezed them to produce extraordinarily high pressures and temperatures — sometimes above 4,000 ºC — to simulate the hellish conditions of Earth’s interior. He found that silicon and oxygen crystallized out together, as silicon dioxide, whenever both were present. When silicon dioxide precipitated in the early Earth, it would have made the remaining melt buoyant enough to continue rising, thus setting up the churning motion needed to sustain the dynamo, Hirose reported. “As far as I know, this is the most feasible mechanism to drive the geodynamo,” he said.